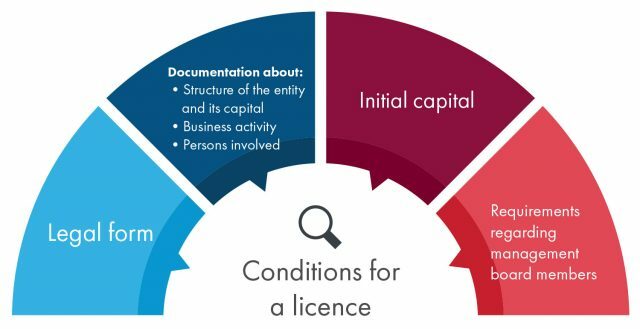 Whether or not a provider requires a licence or not naturally depends on the type of activity conducted – sometimes also in relation to specific products (loans, securities, accounts). Here you can access lists of all activities that require licences. In any case, some general criteria however apply: The activity must have a connection to Austrian and must be performed on a commercial basis. List of investment services listed in Article 3 para. 2 of the Securities Supervision Act 2018 (WAG 2018; Wertpapieraufsichtsgesetz) – currently in German only. List of payment services listed in Article 1 para. 2 of the Payment Services Act 2018 (ZaDiG 2018; Zahlungsdienstegesetz). The activity of managing an Alternative Investment Fund (AIF) pursuant to Article 4 para. 1 Alternative Investment Fund Managers Act (AIFMG; Alternative Investmentfonds Manager-Gesetz) and the definition in Article 2 para. 1 AIFMG. The activity of operating a contractual insurance undertaking listed in Article 6 para. 1 of the Insurance Supervision Act 2016 (VAG 2016; Versicherungsaufsichtsgesetz). It is also possible that you may conduct an activity requiring a licence as a natural person. Licence holders may, however, almost without exception be legal persons. As a natural person you are allowed to operate an investment services provider pursuant to Article 4 para. 1 of the Securities Supervision Act 2018 (WAG 2018; Wertpapieraufsichtsgesetz) or as a tied agent (Article 1 no. 44 WAG 2018) or a securities intermediary (Article 1 no. 45 WAG 2018) respectively in cooperation with a licenced undertaking. Payment services may also be provided in accordance with the Payment Services Act 2018 (ZaDiG 2018) in a licenced payment service provider, in which case you act as an agent in accordance with Article 22 ZaDiG 2018. The banking activity of brokering of loans pursuant to Article 1 para. 1 no. 18 point b BWG may also be conducted by natural persons holding the relevant business licence, and in that case do not require a banking licence. A licence is required by anyone active in Austria, even if they are not incorporated in Austria. It depends whether your business model is actively addressed towards the Austrian market. Whether it is may be indicated in various manners, such as an Austrian website, Austrian contact details, marketing activities in Austria or the establishing of an Austrian distribution network. Companies may be active on a cross-border basis by means of the freedom to provide services and the freedom of establishment by virtue of holding a licence in another EEA country. They should notify their home authority, which in turn then notifies the Austrian Financial Market Authority (FMA). A list of entities that are authorised to be active on a cross-border basis, can be found in the FMA Register on this website. An additional condition is that the activity is provided on a commercial basis. However, in this regard market participants unfortunately make particularly frequently false assumptions. The term of “being provided on a commercial basis” is based on Article 2 UStG and involved an autonomous and sustainable activity for the purpose of generating revenues. The intention to realise profits is not necessary. Even the intention to conduct the activity to cover costs suffices. Purely technical service providers often develop FinTech models in addition to their other products or services, but such sub-divisions barely bring in any revenue. This however, does not exclude the possibility that a service requiring a licence is (also) provided. In particular in the field of new payment methods, such business models assume that the forwarding of payments only constitutes an ancillary service and therefore that a licence would not be necessary. However, only in the case that it actually is a free ancillary service, i.e. a standalone principle service is the subject of the contract, for which the payment service is conducted in a non-independent manner and free of charge, then the commercial nature of the service may be excluded on a case-by-case basis. How long a licensing procedure ultimately lasts and how complex it is depends on the case in hand: The type and scope of the licence applied for, the business model of the applicant, and the quality of documentation provided affect the duration of the procedure. Below you can see the individual stages of a licensing procedure using the example of a payment service provider. In the case of banks the procedure is more complex by dint of having to also involve the ECB. 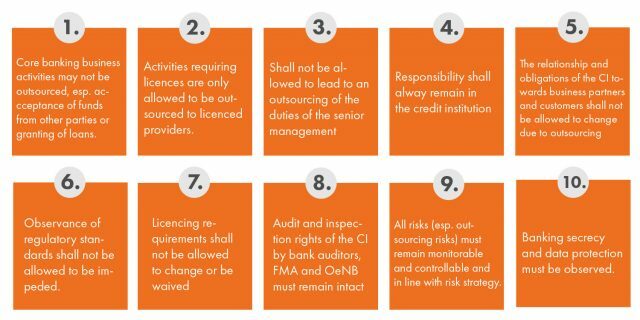 A wide range of rules apply for supervised financial market participants, which however depend strongly on the type of service provider: A whole range of information can be found regarding the licensing requirements and rules for supervised FinTechs under the individual subsections in the “Supervision” section on the ( FMA Website). In the section “Law” you can inform yourself about the FMA’s competences in the Financial Market Authority Act (FMABG; Finanzmarktaufsichtsbehördengesetz) and on the one hand can also find out everything about costs and charges, as well as all Circulars, Minimum Standards and Regulations issued by the FMA. If a FinTech cooperates with a supervised entity, e.g. a bank, then the bank is required to observe outsourcing regulations that may also affect the FinTech.